Born in Zaragoza in 1966. Technical Trainer in the Schindler Zaragoza Training Centre. Head of the Mountaineering Committee of the Aragonese Mountaineering School. 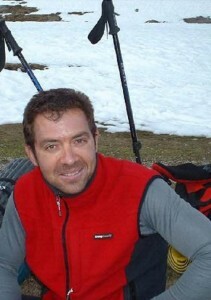 Head of Expeditions of the Aragonese Mountaineering Association. 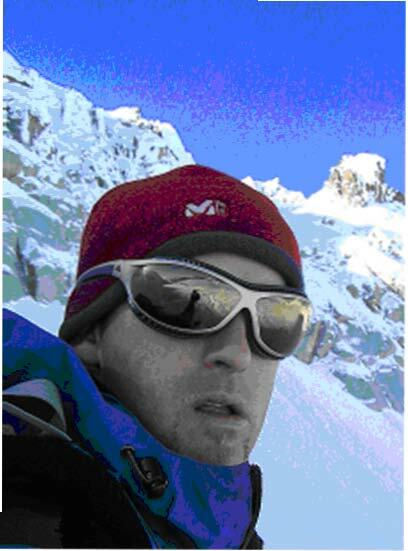 Climbing and Mountaineering Instructor of the Aragonese Mountaineering Association. He has worked intensely in the Pyrenees, practising all the different sports mountaineering has to offer. -1993. Kilimanjaro (5995 m) following the Marangu/Umbuwe route. -1998, led the Schindler Expedition to the Aconcagua which was both an unprecedented sports and commercial success. -2002. Central Tien Shan, World First Ascent of Shipilov Peak (6201 m), a Virgin Mountain. -2004. Grampians, Ben Nevis (1344 m), climbed following Comb Gully, North Face. A route of great difficulty and requiring commitment. -2005. Aragonese Expedition to the Nanga Parbat 8125 m. Bronchitis prevented him from reaching the top. -2006. Aragonese Expedition to the Broad Peak (8047 m) Height reached 7200 m.
Fireman in the Cinca Medio Region. Sports Technician. Degree in Mountaineering and Climbing. He has worked intensely in the Pyrenees, practising all the different sports mountaineering has to offer: rock and ice climbing, mountaineering, canyoning, mountain biking and cross-country skiing. -Alps, among others, he climbed Mont Blanc, Mont Blac du Tacul, Breithon, Dome de Neige and Ecrins. -2005. Atlas, he reached the top of Toubkal (4167 m) and also completed various high difficulty climbing routes in the Todra Canyon. 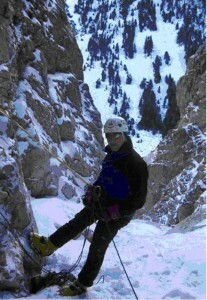 Ice climbing in the Pyrenees, among others, Gavarnie and La Grave in the Alps. Taking part in Mountain biking competition and adventure raids. Nacido en Zaragoza en 1970. Profesor de Educación Física en Salesianos en Monzón. Instructor de Alpinismo de la Escuela Aragonesa de Montañismo. Instructor de Alpinismo de la Escuela Catalana de Alta Montaña. Ha colaborado en la guardería del Refugio del Forcau. Autor de la publicación “Genero en Deportes de Aventura” y coautor en “1000 Ejercicios de preparación física” y “1000 Ejercicios de musculación”. Mejor Deportista Montisonense del Año 2005. Domina diferentes facetas del Alpinismo: Alta Montaña, Escalada en Hielo y Roca, Esquí de Montaña, Barranquismo, BTT. . . .
-Alpes, ha escalado numerosas montañas entre las que destacan el Mont Blanc (4807m), Cervino (4477m), Mont Maudit (4465m), Dent du Gigant (4098 m). Escaladas en Hielo en La Grave, entre otras. Todas ascensiones realizadas por rutas de dificultad. -2001. Gran Atlas, Jebel Toubkal (4167 m) por la Ruta Ikhibi Sud, combinando esta actividad con numerosas escaladas en la Garganta del Todra. -2002. Tien Shan Central, Intento de la Primera Ascensión Mundial al Shipilov Peak (6201 m) Montaña Virgen. -2003. Andes. Urus Central (5515 m), Vallunarraju (5786 m) y Copa Norte (6177 m). -2004. Grampianos, Ben Nevis (1344 m), escalado por el Comb Gully. -2004. Pamir, Korgzenveskaya (7015 m), primera ascensión aragonesa, completándola integralmente en solitario. -2005. Expedición Aragonesa al Nanga Parbat (8125 m). Cumbre por el Diamir.